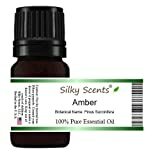 Amber essential oil is one of those oils that is found in many everyday products but no one is aware or familiar with what it does. It has no real fragrance of its own but amber essential oil blends well with scents such as sandalwood and frankincense. Though it may not be the first oil you think of when considering what to use in your daily routines, there are many proven benefits and uses of amber essential oil. Amber can be diffused directly into the air, but can also be paired with frankincense, another resin based oil. Add a few drops to water and breath when you feel a bit of chest congestion. Diffuse amber oil with lavender to have a truly relaxing experience and help manage the symptoms of depression and anxiety. Use amber as an addition to massage oil and revel in an intimate massage with your partner. This oil should also mix well with ylang-ylang, which has also been proven to help relax and arouse. Amber essential oil has anti-bacterial properties which can kill the mold and bacteria in the air, helping to keep the air fresher. This benefit can be paired with other oils such as orange or lemon since amber oil blends well with many other oils. Diffusing this oil in your home should improve the aroma and perhaps even ameliorate some breathing issues. Applying amber oil with a mix of peppermint and turmeric may ease arthritic joints and temporarily stop the pain of wounds. Many people commonly use this oil topically, and they simply add two or three drops to their skin on their extremities and rub it in. The oil will soak through your skin and encourage good blood flow. I am always on the watch for anything that will help me in my journey towards total mental health. I have suffered with depression and anxiety since I was young, but it was brought to the fore after the birth of my children. I’ve been seeing my doctor to manage the symptoms and even changed my diet completely, but it never seems like the medication is enough. I turned to essential oils to complement my medical therapies. It began with lavender to help me relieve stress and anxiety at particular times, such as deadlines at work since this seemed to trigger the worst of my symptoms. Eventually, my research led me to other oils such as ylang-ylang, chamomile, and, strangely, amber oil. The only time I’d ever pictured amber was during that dinosaur movie. Just a pretty orange rock that sometimes had an insect trapped within. But an oil as well? Apparently, this resin trapped all kinds of substances in it as the plant grew, then preserved them as it hardened into a rock. One of the best attributes is that it doesn’t have an overwhelming scent on its own. Amber essential oil blends well with almost anything, but especially frankincense, another tree resin, and sandalwood. This makes for a very masculine smell at times, but it has certainly worked to ease many of the symptoms of my depression and anxiety without the need for additional medication. It is always recommended to use a therapeutic grade of any oil to prevent any reactions. This oil is not a mix of other oils that complement amber, as many may tend to be. It has been distilled directly from amber resin to create a thick oil that requires very little to enjoy its effects. Try only one or two drops mixed with a carrier oil for a very natural perfume that is subtle in scent. Being a therapeutic grade of oil may help prevent any skin sensitivities, so you can enjoy the different health benefits found in amber essential oil. Highly concentrated, a few drops go a long way. If you’re looking for an all-day scent that doesn’t overpower, then this oil-based paste may fit the bill. You may have to practice with the application as it is a paste rather than just an oil. You may need to find the amount that is just right for you. Since it is made from oils, it doesn’t evaporate at the same rate as alcohol-based perfumes. It is also subtler since amber itself has a scent that blends well with many other essential oils. This natural aroma will follow you throughout the day. Pregnant women and children should not use amber essential oil. It can have stimulant effects which may cause miscarriage. People on medication for circulation issues should consult their doctor since it can affect the circulation of the skin. Do not use amber oil if you have skin sensitivities. This oil may cause a rash in certain individuals. Test a patch of skin before using topically. This oil is not recommended for consumption. It may cause diarrhea and nausea. Always use a therapeutic grade of oil to prevent the presence of other chemicals. I know that amber essential oil may not be the first thing that comes to mind when thinking of either oil or amber, but this ancient substance has a lot of benefits to go beyond being a pretty piece of jewelry. Be sure to share with anyone who is curious about amber essential oil benefits and how it can be used in their life.